Our blood is Mexican but in our hearts, we are Washingtonians. My husband, Manuel, and I migrated to the Yakima Valley in 1994. Our four kids were born here. We love the forest of Washington. Manuel and I are very involved in diabetes education and prevention and Alzheimer’s disease awareness. Lily provides health and diabetes education to community members. A couple of years ago, after an open-heart surgery, my mom started showing signs of dementia during her recovery time. None of my nine siblings were even talking about her forgetful pattern. Not because they were ignoring the signs, but because they didn’t know anything about dementia. After her surgery my mom had to stay in the hospital for six weeks. When people asked, “How long were you in the hospital?” She would respond, “Only one week.” She doesn’t remember the chaos that we lived in the hospital. As you can see by our family’s example, Alzheimer’s does not respect ethnicity. According to the National Hispanic Council of Aging Latinos are 1.5 times more likely to develop Alzheimer’s disease than non-Hispanic whites. According to a study from the National Hispanic council of aging there is a lack of factual knowledge about Alzheimer’s, its causes and treatment options in the Hispanic community. The lack of language skills, medical coverage and lack of access to medical care can make Alzheimer’s or other types of dementia more difficult to manage for the Hispanic community. The Alzheimer Association knows this and has begun an educational movement in Yakima. However, education is not just a one-time event. We need to keep the momentum moving forward to increase knowledge among the different ethnicities, and to improve the communication between patients and providers. A few years ago not everybody knew about diabetes. Today one out of three adults in this country has pre-diabetes, but awareness and education are giving us the skills and tools to fight against diabetes. I have been an educator in this country for the last twenty years, and honestly, I rarely hear the word Alzheimer’s within my group of colleagues and lifestyle coaches. What are we waiting for? A multicultural Alzheimer’s Awareness Campaign is urgent. And we need to use all the marketing vehicles: radio, TV, newspaper, twitter, Facebook and others. Everybody has to know what Alzheimer’s is; people need to know that Alzheimer’s, cardiovascular problems and diabetes are very good friends and love to be together. With each person that hears this, I hope for better services and a better future for people with Alzheimer’s. If you or someone you love has dementia or Alzheimer’s, call the Alzheimer’s Association 24/7 Helpline at 1.800.272.3900 or visit alzwa.org. Editor’s Note: This blog post has been transcribed from a speech given by Lily at the Alzheimer’s Association’s Reason to Hope event. 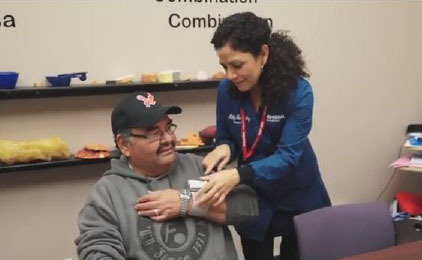 Bertha “Lily” Gonzalez is the Life Style Coach and Master Trainer for the National Diabetes Prevention Program at Yakima Memorial Hospital and is Master Trainer for the Chronic Disease Self-Management Program with Stanford University. She is Diabetes Educator Certified, a Community Health Worker and has a passion for Health Education and Promotion via one on one, group session, seminars, conferences, workshops and/or through radio, TV, newspaper and other media vehicles. She is currently working on her Master in Public Health Degree/MPH through Concordia University/Nebraska.